Reportedly, the company is hiring from all 50 states. However, this isn’t mentioned in the job listings and the company hasn’t yet confirmed it. We’ll update here when we have more info. The Work at Home Client Care Representative 1 position is responsible for providing a world class experience to Jackson Hewitt current and potential clients by answering calls or web chats in a Work at Home Contact Center environment. You will resolve 1st Tier level interactions via phone and chat, or escalate to Tier 2 upon Client request or applicable resolution path. This is a Seasonal Position with a duration up to 6 months. To perform the job successfully, the individual must be able to execute each essential duty satisfactorily. Other duties, assignments and specific projects may be assigned at the discretion of executive management. • Use available tools, knowledgebase, and communication skills to effectively research and transmit accurate information with a goal of resolving the Client’s reason for contact in one call. • Take ownership in assisting, researching, resolving, or escalating Client issues. • Verbally de-escalate and handle difficult Client situations. • Understand and implement new information and procedures efficiently and professionally. • Understand detailed policies and procedures and explain these to the Client in a manner which is easily understood. • Utilize multiple systems to access Client information, research issues, educate and solve the Client’s reason for contact. • Accept and implement Quality and Performance Management Coaching / Feedback. • Handle and hold secure confidential and sensitive Client information. • Diligently and accurately document Client records and cases. • May be asked to assist with other program support including email, web chat, co-browse, outbound and other support initiatives. • High School Diploma or GED required. • Proficiency in Microsoft Office, Contact Center applications, quality monitoring tools and applications, center reporting tools and technologies. • 1 to 2 years of relevant Contact Center experience. • Proficiency with learning new technology and system applications. Excellent computer navigation and data entry skills • Strong communication skills and solutions orientated • Must demonstrate excellent voice quality, inflection and present a professional, courteous, patient demeanor and the ability to maintain a confident, friendly and helpful tone in conversation. Bilingual Spanish a plus. The Operations Support Representative 2 position is responsible for providing a world class experience to Jackson Hewitt Franchise and Corporate Employees by answering Advanced Hardware and Networking troubleshooting calls or web chats in a Work at Home Contact Center environment. You will resolve 2nd Tier level interactions via phone and chat, or escalating to Operations Support Management or applicable Business Owners, depending on documented issue resolution path. This is a Seasonal Position with a duration of up to 6 months. assignments and specific projects may be assigned at the discretion of executive management. transmit accurate information with a goal of resolving the Employee’s reason for contact. friendly and helpful tone in conversation. Take ownership in assisting, researching, resolving, or escalating Employee issues. Verbally de-escalate and handle difficult Employee situations. Understand detailed policies and procedures and explain these to the Employee in a manner which is easily understood. Utilize multiple systems to access Employee information, research issues, educate and solve the Employee’s reason from calling. Accept and implement Quality and Performance Management Coaching / Feedback. Handle and hold secure confidential and sensitive Employee information. Support issue resolution with Remote Desktop Support Software. Manage and follow up on assigned case load per Service Level guidelines. chat, co-browse, outbound and other support initiatives. This job is essentially the same as the non-bilingual CCR opening listed above, except with the bilingual component. Salary isn’t mentioned, but usually bilingual skills receive a higher rate. We’ll post here if we find out more. For details and to apply, click here. For more jobs like these, be sure to check our Newest Jobs & Gigs page. To get our new job postings ASAP, like our Facebook page and check your feed for our posts. May you be working from home soon! 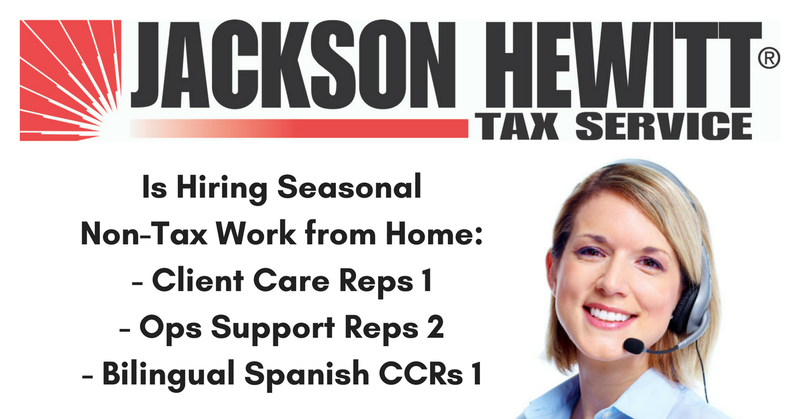 This entry was posted in Seasonal Jobs, Tech Support, Work at Home Jobs and tagged Jackson Hewitt. Bookmark the permalink. ← 90+ Work from Home Jobs With Cigna – Great Benefits!